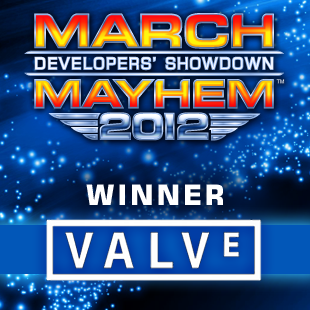 March Mayhem 2012 Is Over, Valve Wins! March Mayhem: Developers' Showdown 2012 is over and the winner is none other than the creators of Portal 2, Valve Software. At the beginning of this year's March Mayhem, industry heavy hitters Bioware and Bethesda were projected by most community members to make it to the final showdown, but Mojang was still on the tip of everyone's tongue. Last year, the indie sensation Mojang was voted into March Mayhem by members of The Escapist Publisher's Club for one of four wildcard spots going up against the number 1 seeds. Little did fans suspect that the Minecraft community was strong enough to send a powerhouse like Nintendo home in the first round. Mojang continued its Cinderella journey as it bulldozed through veteran developers Namco Bandai, Epic Games, and Obsidian before finally crushing last year's champion, Valve. 2012 was a different story. The first few rounds led to surprising upsets, including Double Fine's stunning defeat of D.I.C.E. in Round 2 and Lucas Art coming out on top against Atlus in Round 1. Double Fine seemed poised to win March Mayhem with their huge margins of victory and seemingly unstoppable momentum, but as the dust settled and the competition became fiercer, it became apparent this year's title would not be awarded to a wildcard. After a 3 day battle during the Final Showdown between Bioware and Valve, with community pushes made by both companies and raging debates on the forums touting the undeniable merits of both developers, Valve emerged victorious. Not only has Valve been selected as the winner of March Mayhem 2012, but they also won a paid advertising contract with The Escapist! In addition, Bioware, Mojang and Bethesda received advertising contracts for winning their divisions or being part of the Final Showdown. Congratulations to all the winners and a big thank you to everyone who participated in this event. A special thanks to Jamash, NeoAC, KefkaCultist and SrBryghtside for being our Escapist Ambassadors and helping answer questions from new members as well as fielding questions regarding the tournament. March Mayhem: Developers' Showdown 2012 is over, thank you once again and see you next year!